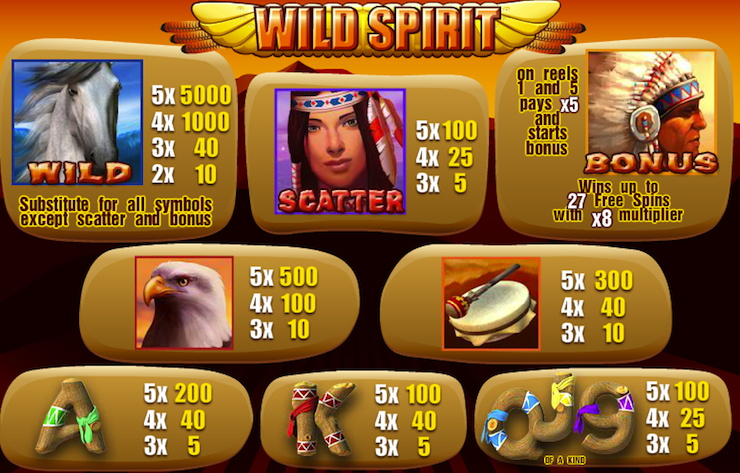 Wild Spirit is a Native American-themed slot game that incorporates various Native American traditions and folklore. The symbols are a tribe chieftain (the bonus symbol), a young squaw wearing a headband (the scatter), a white horse (the wild symbol), an eagle, a drum, and ace, king queen, jack and nine (these are represented as pieces of wood, tied with fabric). There are nice extra touches thrown in, such as when you score three or more eagles on an active payline, and an eagle soars off into the distance. Wild Spirit has five reels and 20 paylines. Some of the important symbols in Wild Spirit include the Indian Girl, which acts as the scatter symbol, the Indian Chief, which acts as the bonus symbol, and the Wild Horse, which is the wild. There are also drums and eagles. To earn free spins, you'll need to hit three or more scatter symbols anywhere on the reels. You'll then be brought to a bonus screen on which you'll choose some of the symbols to reveal your free spins. You can win a maximum of 27 free spins with an 8x multiplier during any given bonus round. The gamble feature enables you to wager double or half-double your winnings after each winning spin. You'll opt-in to the gamble round and then choose a card, hoping that its value is higher than the face-up dealer card. If it is, then your gamble has paid off and you win!